WASHINGTON — Half of all Republican senators are urging President Donald Trump to take heed of Russia’s growing nuclear weapons capability as the New Strategic Arms Reduction Treaty’s expiration date approaches — just one of many partisan salvos this week in Washington’s fight over the nuclear arsenal and its scope. In a letter Thursday to Trump led by Sen. Jon Kyl, R-Ariz, the 25 senators committed to funding the U.S. nuclear weapons modernization program with an eye toward maintaining “a true balance of nuclear capabilities between the parties to the Treaty.” The lawmakers argue Russia has developed nuclear torpedoes and tactical nuclear weapons, which are not covered by the accord and should be included if the treaty is revised. Signed in 2010, the pact limits both U.S. and Russian deployed forces to 1,550 warheads and over 700 delivery systems, including intercontinental ballistic missiles, submarine-launched ballistic missiles and bombers, by 2018. The New START Treaty expires in 2021. The lawmakers argue that because Russia is breaching its arms control commitments — including the 1987 Intermediate-Range Nuclear Forces Treaty by developing, producing and deploying a ground-launched cruise missile and launcher — it’s critical to fund nuclear modernization, including a controversial low-yield warhead, as proposed in Trump’s Nuclear Posture Review. 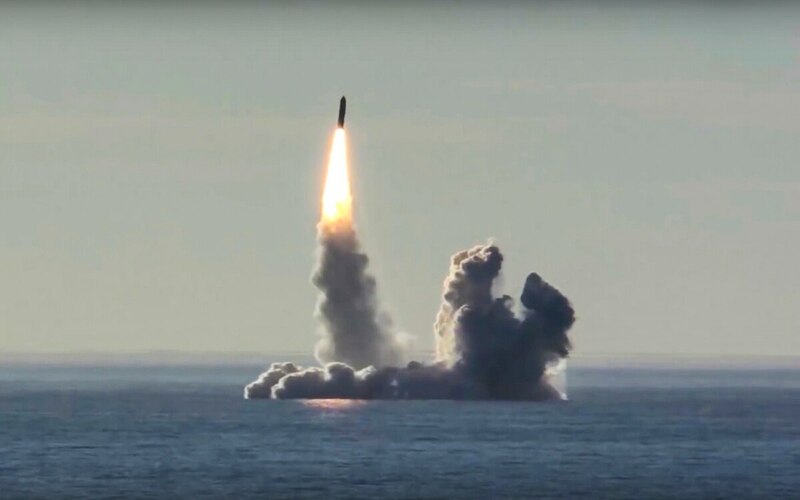 Proponents of the low-yield warhead, a version of the Navy’s Trident II D5 ballistic missile, dubbed the W76-2, say the weapon will deter Russia from using its own arsenal of low-yield nuclear weapons. “To convince Moscow that there are no possible benefits to limited nuclear escalation, the United States needs to diversify its nuclear delivery system options on the lower levels of the escalatory ladder, including adding submarine-launched missiles and sea-launched cruise missiles with low-yield nuclear warheads,” Kyl wrote Thursday in The Washington Post. The piece was co-written with Michael Morell, a former deputy director and twice acting director of the CIA. On Wednesday, Sen. Tom Cotton, R-Ark., and Rep. Liz Cheney, R-Wyo., introduced the Stopping Russian Nuclear Aggression Act, which would prevent funding to extend New START until Russia agrees to verifiably reduce its stockpile of tactical nuclear weapons and include its new systems under the treaty. Cotton is on the Senate Armed Services Committee and Cheney is on the House Armed Services Committee. Cheney, Kyl and Morell were among panelists listed at the Reagan National Defense Forum in Simi Valley, California, this weekend. Click here for Defense News coverage of the 2018 Reagan National Defense Forum. On the flip side of the issue, Sen. Elizabeth Warren, D-Mass., unveiled her foreign policy platform Thursday, perhaps ahead of a 2020 presidential run, which calls for no new nuclear weapons, extending New START through 2026 and a no-first-use policy for nuclear weapons. When Trump is undermining arms control agreements, she said, the U.S. “should not spend over a trillion dollars to modernize our nuclear arsenal." “The president has threatened Russia with a nuclear arms race, saying we’ll simply outspend our rivals. Boy, is that wrong,” Warren said in remarks at American University. “The United States has over 4,000 nuclear weapons in our active arsenal, and our conventional military might is overwhelming. Trump’s nuclear arms race does not make us or the world any safer." While Russia’s new weapons should be part of extending and renegotiating New START with Moscow, the U.S. will need to give something to get something, said Arms Control Association analyst Kingston Reif. By Reif’s reckoning, threatening New START actually frees Russia to expand its arsenal of strategic nuclear weapons pointed at the United States after the treaty expires. “If New START is allowed to expire without a replacement, Russian nuclear forces would be unconstrained, our ability to verify what Russia is doing would be curtailed, and the incentives to engage in costly nuclear competition would be magnified,” he said. Democratic lawmakers say they hope to use their party’s takeover of the House to check the Trump administration’s expansive pursuit of nuclear weapons. In a sign of partisan tensions on the topic overall, SASC chairman Sen. Jim Inhofe, R-Okla., traded barbs this week with the prospective next HASC chairman, ranking member Rep. Adam Smith, D-Wash.
Inhofe this week announced that modernizing America’s nuclear triad was a key goal of his for the next year’s National Defense Authorization Act; and in an interview with Defense News, he criticized Smith, who has questioned the Pentagon’s proposed $1.2 trillion refurbishment of each leg of the arsenal and opposed certain new weapons systems, including the W76-2. In an interview Thursday with Politico, Smith said he is open to the bipartisan cooperation needed to enact the bill and questioned whether Inhofe felt the same way. Another partisan flashpoint is Trump’s announcement last month to unilaterally “terminate” the INF Treaty, fueled by fears Moscow has developed and deployed a prohibited missile and that China, which is not a party to the pact, is gaining a military advantage in East Asia by deploying large numbers of treaty-noncompliant missiles. Forty-one Republican lawmakers expressed support Thursday for Trump’s decision to drop out, and in a letter to Trump, led by Cheney, they wrote that Russia’s treaty breaches pose a threat to national security. Four Democratic senators on Thursday introduced legislation aimed at keeping the U.S. in the INF Treaty. It would block development of a new class of intermediate-range missiles. The sponsors of the legislation called on Trump to convene allies at the ongoing G20 summit in Argentina to develop a unified approach to resolve Russia’s violations. The bill would bar funding for a U.S. ground-launched or ballistic missile — with a range of between 500 and 5,500 kilometers — until the Trump administration provides a report that meets five specific conditions. The legislation, called the Prevention of Arms Race Act of 2018, is sponsored by Warren, and Sens. Jeff Merkley, D-Ore.; Kirsten Gillibrand, D-N.Y., and Ed Markey, D-Mass. Warren and Gillibrand are SASC members, and Merkley and Markey serve on the Senate Foreign Relations Committee. “This legislation will help ensure that we don’t match two major adversaries missile-for-missile, trigger a new nuclear arms race, and incur unacceptable amounts of risk in an already tenuous security environment,” Markey said in a statement.